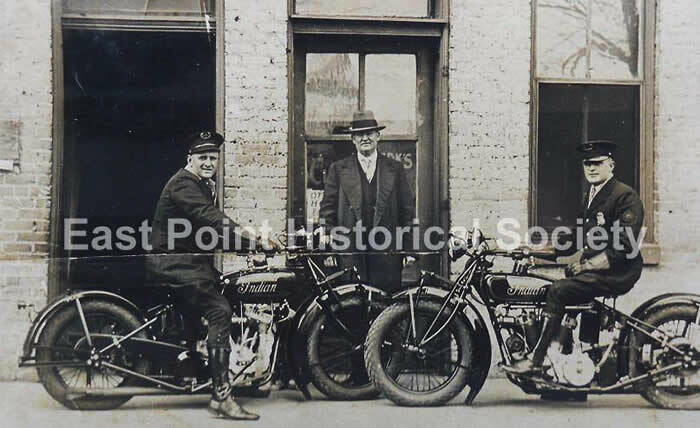 East Point police chief and two motorcycle patrol officers, circa 1928. Chief J. W. “Joe” Miller (standing) served as chief of the East Point Police Department from 1908 until he died of an illness in 1938. Officer Jack Parker (at right) served the EPPD from 1925 until his tragic death in 1929. Parker lost control of his motorcycle while maneuvering a curve on Connally Drive. He was 30 years old. Officer W. H. “Bill” Tyler (at left) joined the EPPD in 1923 and succeeded Chief Miller to serve as chief from 1938 until his retirement in 1968.